This is the final review of the Memebox offerings. The company announced last week that they are suspending international shipping (South Korea, China and the US can still order as there are locations in those countries). It is a little disappointing but I would rather they limit their focus and do it well instead of expanding and doing it poorly (take that Canadian Target stores). Ok. Back to the box. This one is titled Daily Must Wears and I figured it would be a good mix of skin care items and makeup. There were 2 teaser items listed on their webpage. The cost of the box was $29US plus $6.99 shipping. I had a $5 coupon for any purchases over $30 so it ended up being $30.99. The exchange rate to Canadian will kill ya though. Let's start on the items. 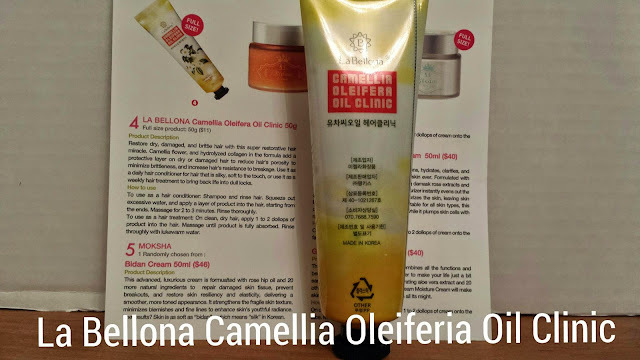 First up is La Bellona Camellia Oleiferia Oil Clinic. Cost $11 (50g). Essentially a hair treatment that can be used as traditional conditioner or add to dry hair and massage in then rinse out. 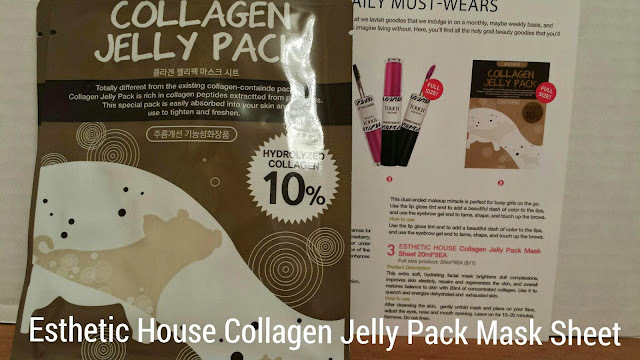 Made with Camellia flower and hydrolyzed collagen. 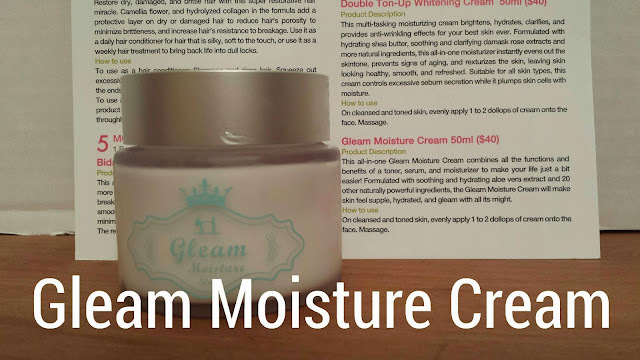 Next is the Gleam Moisture Cream. Cost is $40 (50g). They claim this is an all-in-one with the benefits of a toner, serum and moisturizer. Made with aloe vera extra and 20 other naturally powerful ingredients - what they are I don't know. Heavily fragranced. Lailly 7 seconds Makeup Booster costs $41 (50g). Essentially it is a face primer for under your foundation. 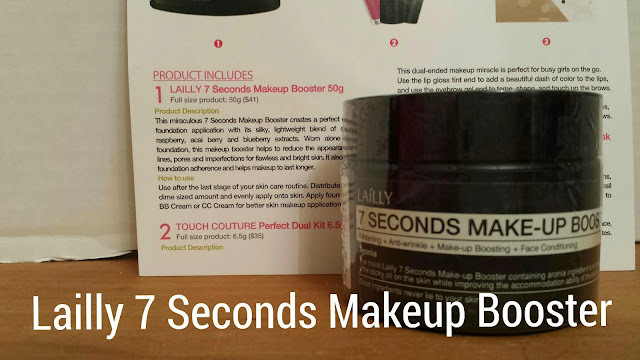 Contains strawberry, raspberry, acai berry and blueberry extracts. Yep, it's really green but when it is applied it is colourless. I've been trying this for a couple of days and it works as well as any other primer. 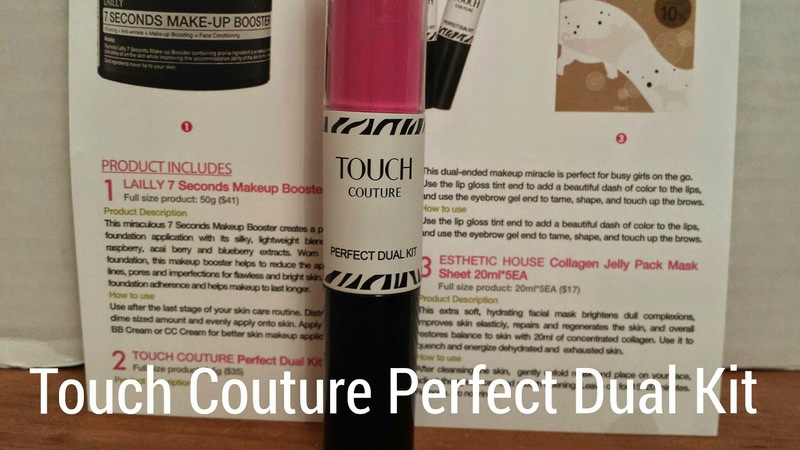 The fourth item is the Touch Couture Perfect Dual Kit. 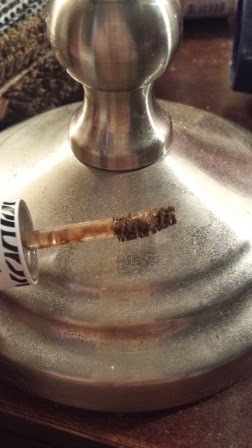 Cost is $35 (6.5g). 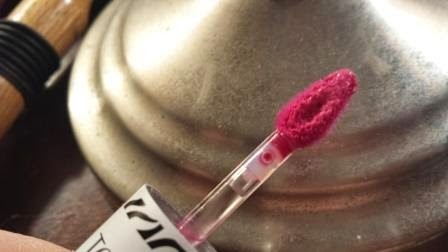 It is a combo of a lip gloss and a eyebrown gel in the same tube. I'm going to admit that it is a little bizzare to put these items together. The gloss is uber pink but actually quite nice. the brow get is a light to medium brown. Unfortunately a lot of product gets gooped on the brush which makes it hard to apply it properly and not OVER apply. Great Berry smell. Has a little staying power. The final item is the Esthetic House Collagen Jelly Pack Mask. 5 masks cost $17. It's a disposable cloth mask that contains pork collagen. Yep, pork. I tried the mask - there is no funky smell (which I worried about) and it left my skin feeling very nice. So that is the final box for Memebox. I thought the items were light on makeup but very interesting items for skin care. I take these prices as arbitrary as I cannot imagine offering $200 worth of items for $29. However I am not disappointed in the offering at all. Here are my other Memebox Reviews.